For some time now most local and global asset class valuations have been trending towards their long-term averages from historical starting points which have been quite expensive. While this is a painful experience as asset classes de-rate, it is a necessary part of the investment journey and has been illustrated consistently over many investment cycles. Investors often call this ‘mean reversion’, simply meaning that cheap assets should go up in price, and expensive assets should go down in price. 2018 was a rather rude reminder as to how quickly this mean reversion can impact investment returns. This is shown clearly in the medium to longer term, where the average investor in a local balanced fund has lagged money market since 2016 over a three-year horizon, and has recently dipped below money market over a five-year horizon. To add insult to injury, many investors are questioning the merit of long term investing and are voting with their feet, moving to money market or avoiding investment altogether. It will be little comfort then to point out that because asset classes have fallen, the future should be brighter! It also won’t help to highlight that through the course of history, we have had worse times. In fact, over the past 100 years there have been nine instances where investors have been worse off than they are today – relative to cash. Local cash investments: 7.4% per year over the past three years. Local equities: (+4.3% per year) Due to a weak domestic economy and weak earnings from companies; stock specific issues (Steinhoff, MTN, Resilient) and the rand headwind. Local property (-1.2%): insatiable demand for property led to an overpriced sector where the underlying economics were not sustainable, none more clearly evidenced than with the Resilient problems but also seen more broadly across the sector. Rand effect: (-2.9%). In 2015 we experienced ‘Nenegate’, where the rand sold off to excessively low levels. 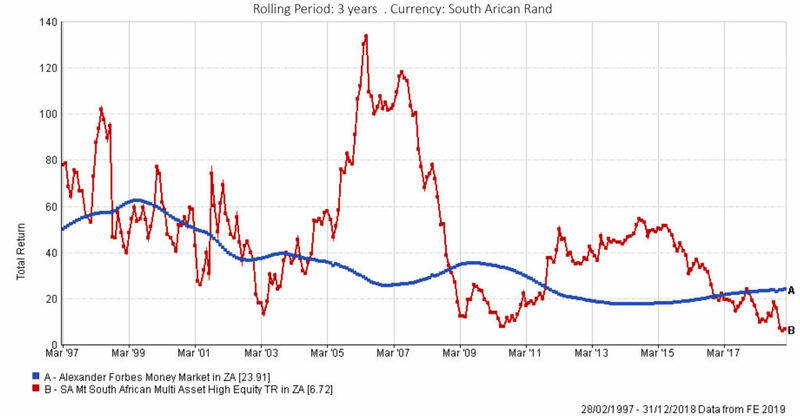 In the subsequent three years to 2018 we have had a ‘mean reversion’ in the rand back towards its stronger expected value – causing a headwind to offshore linked returns which comprise a material part of local portfolios. Offshore equities (4.3%) have been volatile, and the impact of QE, Brexit and the rise of the technology sector has created a complex environment in which to make global equity decisions. The strong rand has also reduced offshore returns. Local bonds (+11.1%) have been the standout performer, for no other reason than during Nenegate they were aggressively sold down on declining confidence in fiscal South Africa creating a low base from which to earn returns. To compound matters, fund managers were largely uninvested in local bonds, forgoing this opportunity for investors. The resulting outcome being a poor return for the average balanced fund investor over the past few years. So where does this leave us? 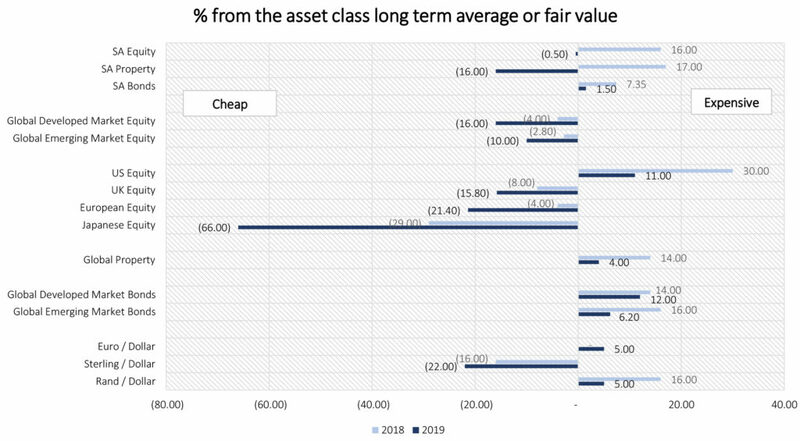 To inform our outlook for 2019 and beyond, we evaluate each of the asset classes relative to their long term average valuations. 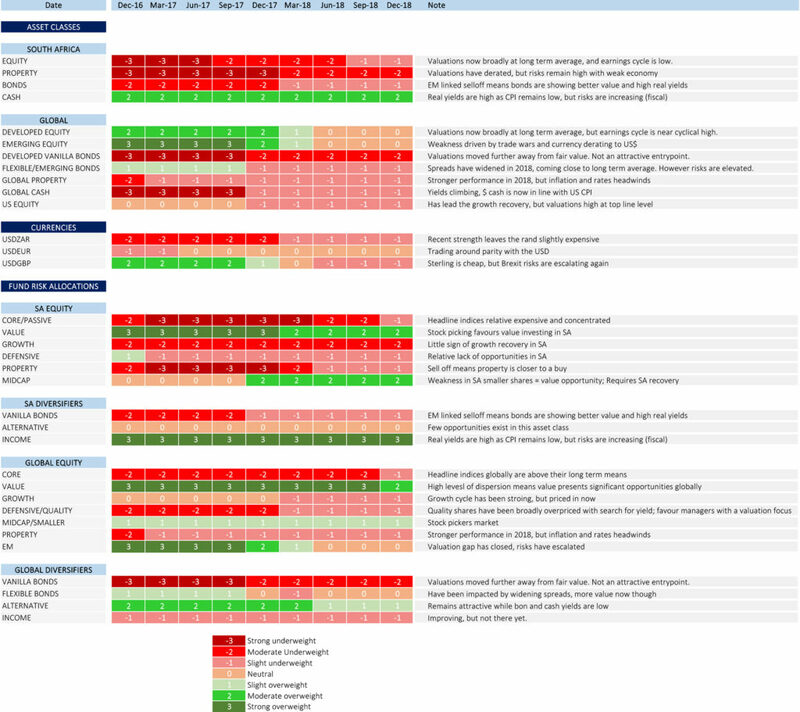 This helps us determine which asset class is due a positive mean reversion, and which is not. Looking back exactly 12 months to January 2018, the starting valuation levels were in aggregate high – with a balanced fund strategy1 starting the year with a 6% premium relative to fair value. At current levels, balanced funds are now on the cheaper side of fair value, reflecting a discount of 4.3%. This bodes well for future returns relative to history. In a global context, 12-month prior levels were also expensive, reflecting a premium for a balanced fund investor of 2.1% one year ago (equities in aggregate were on the cheaper side despite the US being expensive), whereas at todays value’s there is a 5.3% discount – also a positive sign for future returns. Within global equities we are faced with a conundrum in that in a high risk economic environment such as the one we are faced with, the favoured sectors are growth-oriented shares demonstrating strong earnings, and those which are resilient and able to protect their business models and survive any downturn, while paying high levels of dividends. The problem we face is that both of these tend to be quite highly priced at present, so entry points are not that attractive. On the flip side, lower quality cyclicals and emerging markets (which tend to be held by the value managers at this stage in the cycle), rely on a positive forward looking global growth outcome, so are vulnerable to any material event or slowdown. There is no easy route to global equity investing in 2019, and it pays to be diversified. Global debt: The single largest risk we see globally is that of aggregate debt levels, both in governments as well as within corporates. In terms of issuance it must surely fall into bubble territory. High debt levels may be sustainable if countries and companies have strong balance sheets and healthy economies, but they are extremely vulnerable to any inflation or rates shock. The consequences of this would be extreme. Brexit: the UK is relatively small in global terms, however Brexit does have the ability to impact Europe and the general risk mindset of investors. A hard Brexit and potentially a change in leadership would not bode well. A slowing Chinese economy: GDP continues to trend down, and the US led trade wars may also impact prospects. China is fully integrated with developed and emerging economies and any significant adverse event would hold back investment returns. Global Value equities: from (3) to (2) as valuations have declined in aggregate to below fair value, the relative appeal of other equity options is higher and the case for Value weaker. In conclusion, the good news is that the pain of the prior years can also be the pleasure of future years. Lower aggregate valuations bode well for returns. The mean reversion cycle is something which tends to repeat, and what we hope for in 2019 is that the global economy provides a chance to achieve that for investors. Represented by a passive set of constituents where we build the aggregate portfolio up and overlay the relative premium or discount for each asset class to arrive at a total value.